It’s delicious and it’s low carb, and there are a number of ways to prepare it. Mostly, you can use it as a potato substitute – roast celeriac instead of roast potatoes, mashed celeriac instead of mashed potatoes etc. If you’re not familiar with celeriac (and I wasn’t until very recently) the taste is similar to celery, but the texture is very different. It has a really savoury taste and you might end up preferring it to potato. 100g of celeriac contains roughly 9g of carbs (with 2g of fibre) and it is a good source of Vitamin C, potassium and magnesium. Here is a very simple recipe for braised celeriac, which goes well with roast chicken. Peel the celeriac and cut it into two-inch cubes. Heat the olive oil or butter in a large saucepan and add the cubes. Brown the cubes for a few minutes, add the garlic and cook briefly (make sure the garlic doesn’t burn) and then add 100ml or about five tablespoons of water. Put a lid on the saucepan, turn the heat down the lowest setting and cook for 25 minutes – or until the celeriac is soft. Add salt and pepper to taste. 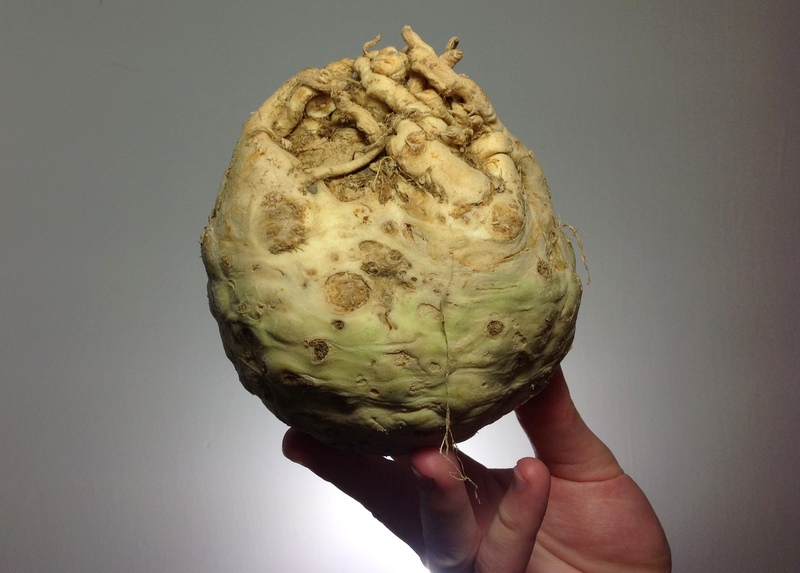 Here’s another great recipe for celeriac, and one for a celeriac salad, and let us know if you have a great use for what is arguably the world’s ugliest vegetable.